'Atabaque' This is an introduction to some more sounds of Brazil. 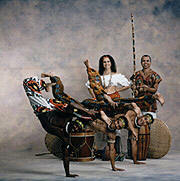 Capoeira is a Brazilian martial art that closely linked to its religious background even today. It is a martial art developed by Black slaves in Bahia to fight their oppressors and took the form of very acrobatic dance when it was prohibited for them to practice. It's continued under the guise of a musical ceremony in which the movements were accompanied by hand clapping and berimbau (a single stringed bow with a gourd that is struck with a stick), whenever the slave bosses came near. Today music continues to accompany Capoeira. In 1930 the first academy was established by Mestre Bimba and has become a dominant part of Brazilian culture. There are now two main schools of Capoeira, both with their own belief in where it originated. It is a fight, a dance and a game composed of fluid circular movements. 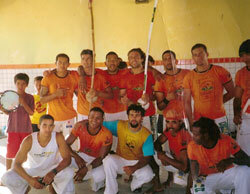 It is playful and energetic and the Capoeiristas show each other the outmost respect. A"roda de capoeiras"provides the singing and accompaniment to the fight. The instrumentation consists of Berimbau, caxixis, pandeiros, reco-recos, agogô and atabaques. Atabaque is a large drum used in capoeira rodas. The skin is made from cow hide, and tightened through a system of metal rings, rope and wooden wedges. To tighten an atabaque, hammer the wooden wedges downward, but always take the atabaque out of its stand first. Otherwise the stand can be weakened and break. The basic beat of the atabaque in the capoeira roda is very similar to that of the pandeiro - four beats with an emphisis on the third. Typically this is played with the hands in the following pattern: [right, left, RIGHT, right] Try to avoid resting your hand on the rim of the drum. Check out capoeirista.com for more on these instruments and sound files on berimbau rhythms and more. In the Pacific Northwest we have at least two schools of Capoeira. One in Seattle, Washington and the other in Vancouver, B.C. Ache Brasil also has schools in Calgary-Canada, Oasak-Japan, Recife, Olinda, Natal, Palmares-Brazil. Mestre Eclilson de Jesus is the founder of Capoeira Ache Brasil, which was the first Capoeira group in Canada and paved the way for Capoeira on the Westcoast. Aché Brazil. He has come a long way since he first set foot in Vancouver, and with amazing dedication to the preservation and teaching of the art form and authentic music, and initiated many young Canadians in to his Capoeira School on West Broadway in Vancouver, B.C. As director he has developed an amazing performance company of young people, musicians with elaborate costumes that personify the culture of Brasil and haven't missed a beat (or should I say Brasil rhythm) as they demonstrate the many styles and icons from capoeira, samba, maculele, maracatu, samba de roda, gangazumba,coco de roda, samba reggae, frevo, baiao and timbalada. Thanks Eclison, for making our cultures richer with the sounds, movements and color of yours.